June 3rd, two days from now, is the first anniversary of the London Bridge terror attack, in which eight people were killed and 48 injured. It happened yards from where I live. When something like this happens, everyone asks, What can I do? I’d spent the past few years working with the wonderful family of Milly Dowler on a book about their long ordeal. The Dowlers taught me many lessons about how to take testimony from traumatized people about their extraordinary and terrible experiences. It’s a difficult thing to do, and I made many mistakes while trying to understand and convey their pain as well as their incredible combination of dignity, true-heartedness and humour. But the Dowlers were endlessly strong and patient, and we got there in the end. So when the terror attack happened here, to the question What can I do? my answer seemed to be: take testimonies; let people talk; give them the space to make sense of what they saw and went through. And that’s what I’ve been doing – more than a long novel’s worth now. The material was never intended for publication. But some of it will be performed in two services on Sunday’s anniversary at Southwark Cathedral, which has, from the first hour, taken spiritual responsibility for the necessary healing. We are so fortunate to have the leadership of Dean Andrew Nunn, Sub-Dean Michael Rawson, Canon Precentor Gilly Myers and many others who have dedicated themselves to cleansing and reclaiming places that saw violence, composing heartfelt liturgies and sermons and, most of all, reaching out to all those who were harmed physically and emotionally by the attack. None of us who live or work here shall ever forget the victims and their suffering or the pain of those bereaved. They will always be remembered, and their damage has become part of the fabric of this place. We have also found things to bring back from those dark days here. The Cathedral has worked with Amir Eden, a young Muslim community leader, to make sure that the attack has had the opposite effect on this place to the one that the terrorists intended. Diversity, an anathema to extremists, has only been reinforced here. There has been an outpouring of love for our places of life, work, play and worship. There has been bonding between residents and business owners. New friendships have been forged; even several romances. The afternoon of the attack anniversary will be marked by a special service for the bereaved and first responders in the afternoon. In the evening, the Cathedral will host a Grand Iftar for people of all faiths and none. In line with its inclusive, mindful approach, the Cathedral has also commissioned a work of art from Alison Clark. In doing so, they have entered the highly sensitive area of commemorating or memorializing terror. Artists memorializing the Holocaust have come up with interesting solutions to the issue of how to address a brutal incident with no natural poetry to it at all. Some insisted that memorials should not be in places of grace and beauty like parks, but on busy street corners. The Monument against Fascism, Hamburg-Harburg (Jochen Gerz and Esther Shalev-Gerz, 1986) was a 12-metre column designed to sink slowly into the ground, so it never became a taken-for-granted part of the built environment. Looking at it was not a passive activity: viewers were invited to make their own engravings in its lead-clad surface using a special pen provided. Before it sank below the ground in 1993, this ‘counter-monument’ attracted abundant initials, scribbles, graffiti, including swastikas and even gunshots: so the attitudes of the present were inscribed on the past in a dynamic way. The artists wrote of their column, ‘One day it will have disappeared completely and the site of the Harburg monument against fascism will be empty. In the long run, it is only we ourselves who can stand up against injustice’. Another thought behind the artwork was this: each generation needs to find a new way to address the Holocaust. It can never marked ‘done and dusted’. Creativity must do constant battle with forgetfulness when it comes to events that should never be repeated. In this way, society will not be allowed to become desensitized to the crimes of the past. They will stay fresh, shocking and relevant. So it’s not easy to conceive mindful and appropriate ways of memorializing a terror attack. How do you aestheticize suffering and violence? Should you even do so? How do you express the unspeakable? How do you show respect to those cruelly denied the chance to speak for themselves? Involuntary errors of taste and judgement can easily occur if you commission art with good intentions but neglect to consult all the stakeholders in an area that has been subject to terror. 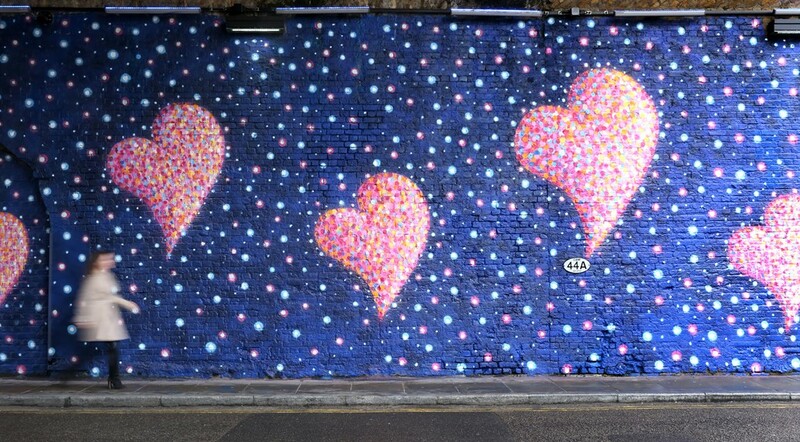 For example, we residents are distressed to watch the thousands of people taking jokey and romantic selfies in front of these sparkly hearts that suddenly appeared in Stoney Street a couple of months ago, described by Network Rail as a memorial to the attack. No decent person willingly shows disrespect to the dead. The selfie-takers are doubtless decent people. 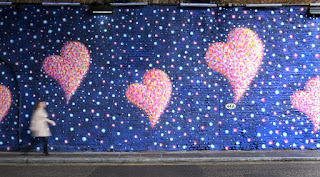 But to them the artwork evidently manifests as happy, funny and romantic. They simply don’t know what they are doing, which is why I am not including a photograph of them. It wouldn't be fair. They have not been given a choice because neither the event nor those harmed are named in the mural. (The name of the artist is, however). There have been other decisions (and omissions) here that have hurt the bereaved and also those that have distressed local people who were caught up in the nightmare of the night. Southwark Cathedral, however, has navigated the difficult waters of memorializing with grace and energy. Key to that is, of course, confronting the damage and not brushing it under the carpet, pink-washing it or privileging commercial considerations over attention to grief and trauma. Alison Clark's artwork addresses both damage and healing in ways that are integral to the experiences of the night. In the course of the Testimony project, I took Alison's account, which she has kindly allowed me to post below. So often, I discovered that the key to the way people reacted to the night and its aftermath could be found in their own past experiences. Alison is no exception. Apart from Alison’s work, there will be other lasting memorials in and around the Cathedral. The 3pm service will include the blessing of four corbels commissioned to mark the anniversary. One is a portrait of Wayne Marquez, the British Transport policeman who distinguished himself by his bravery on the night. Another corbel immortalizes Doorkins Magnificat, the Cathedral’s resident feline. Doorkins has her own book, Facebook page and Twitter account. While the clergy were cordoned out of the Cathedral in the days after the attack, they received many anxious emails about Doorkins. It turned out she was fine and being fed Chicken Caesar Salad by the police. In the Cathedral courtyard, there will be a blessing of an Olive Tree of Healing, planted in the Cathedral Churchyard in compost made from the floral tributes laid on London Bridge a year ago. Mary Hoffman has kindly agreed to swap her slot with mine this month, so I could bring this to you in time for the anniversary, and so that you might also have a chance to come to Southwark Cathedral to see Alison’s beautiful and subtle work and perhaps also to participate in one of her mending workshops. 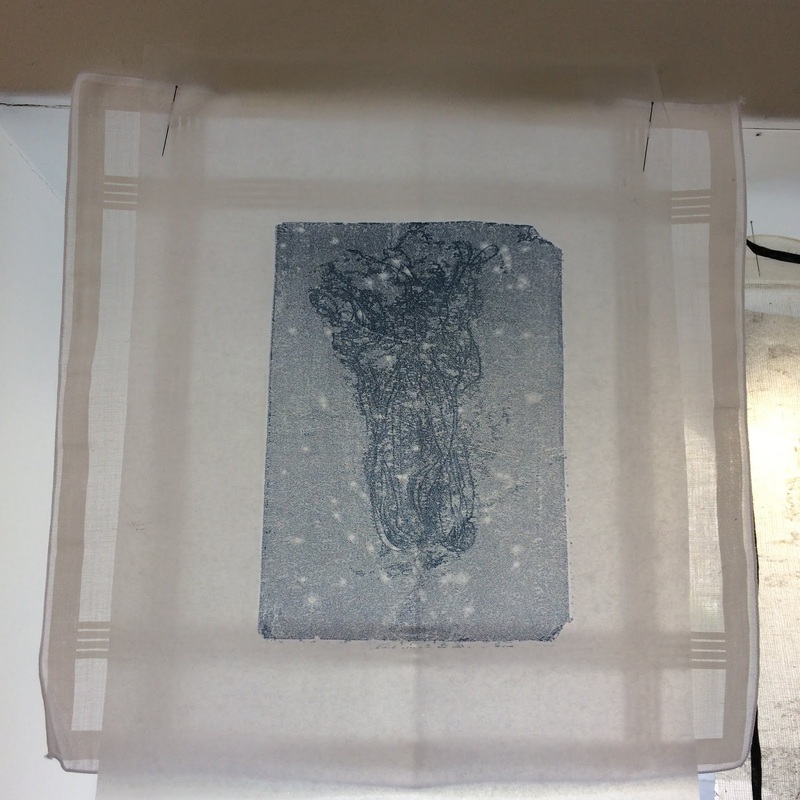 November 2015, artist and academic Alison Clark’s in Paris. She’s nervous about delivering the keynote address at a conference the next morning. Returning to her guesthouse after dinner, she receives texts from her children: Are you all right? Then there’s a Facebook notification, ‘You are in a security zone. Let people know if you are OK.’ That’s how she learns about the attacks on the Bataclan, the cafes, the supermarket. It’s traumatic on many levels. The scale of the killing and maiming is horrific. Terrorists gunned down diners in a restaurant like the one she has just left. The university’s on lockdown; the conference is cancelled, including her keynote address. Alison recalibrates. Anxiety about the speech cedes to real new fears, new priorities. How to leave? Is it safer to stay? Her heart breaks for her French colleagues. For them, the murderous attack on Charlie Hebdo in January 2015 has linked up with this new one. For Parisians, it suddenly feels as if the threat is endless. Once violence has entered your life and begins to repeat, all bets are off. Anything could happen next. For Alison herself, the Bataclan also brings back also the 2005 suicide bombings that took 52 lives in London. She was working in Bloomsbury at the time and walked along the route where, later, a bomb blast blew off the roof off a Number 30 bus. She’ll always remember the missing posters afterwards on the lamp-posts in Bloomsbury. Add to that her academic post in Oslo, where Anders Breivik killed 77 people in 2011. Too many times already, Alison has seen a community in crisis, has heard people say, wonderingly, ‘It could never happen here. But it just has.’ Alison thinks, on a deep level, you connect these events. It becomes cumulative. Because of Breivik, her fear is tuned not to a single group like IS but on the dark potential of all humanity. Her repeated encounters with terrorism have taken away any sense of entitlement to security. For Alison, who has been peripheral, a witness, it’s more a feeling of inevitability, an unacknowledged preparedness. Alison and her husband Jonathan are mid-air when the attack takes place at London Bridge. The moment their flight from San Francisco lands, Jonathan’s mobile tells the horrifying story of what has happened in a place that is close to their hearts. 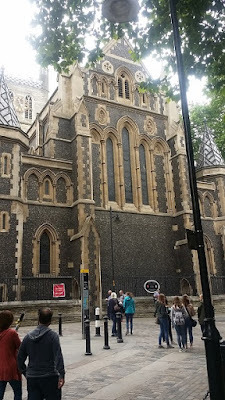 Southwark Cathedral is where Jonathan was consecrated Bishop of Croydon just five years before. As the wife of a clergyman, and an academic based between Norway and England, Alison’s moved around constantly. But Southwark Cathedral is where she has chosen to be a permanent member of the congregation. She attends at least twice as month. There’s something special about a Cathedral community. Southwark in particular is famously inclusive. Despite being a cathedral, it is as cosy and welcoming as a parish church. When she hears what happened there on the night of June 3rd, Alison’s feelings swerve back to the night of the Bataclan; a city in lockdown; police bristling with weapons; a tangible atmosphere of fear; the obsessive watching the news, always tuning in for the next announcement; the eerie silence of a bustling city arrested in its empty 5am persona even in the middle the afternoon. Alison feels deep personal concern for the people at the Cathedral, not just for their safety but knowing what it will mean pastorally. Andrew Nunn, the Dean, is so hands’ on. His responsibilities will be endless. Alison knows how close the cathedral community is to the Borough Market. The two are almost synonymous. It’s painful to learn that the clergy are excluded from their Cathedral by the police cordon. Over the following week, her sadness increases with every day of the lockdown. It is just the time pastorally when the door should be open. The first time Alison returns to Southwark Cathedral is for the Trinity Sunday service, a week after the attack, when it finally opens for the first time for a large gathering. It feels really important to be there. Standing in the courtyard, hearing the bells that summon the worshippers, it feels like a reclaiming of the sacred space. The bells ring in a sense of hope. 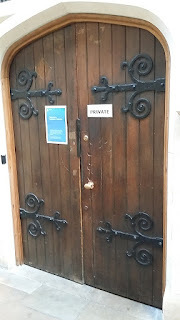 Inside, she listens to Andrew’s sermon, in which he explains the damage caused when the police, hunting for terrorists, used battering rams first to shatter the glass doors to Lancelot’s Link and then to force open the sacristy door. Something stirs in her when Andrew says that the door will not be replaced. Southwark Cathedral will not hide the violence experienced but incorporate it into the experience of the church. In the end, Alison thinks, that’s how healing happens: by acknowledging rather than hiding from pain. It’s fundamental to our Christian faith that Jesus through His suffering has made us whole. A broken Christ brought salvation to humanity. 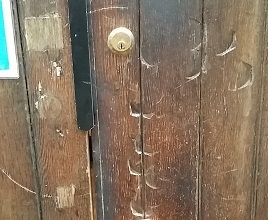 What stays in Alison’s mind is the way the sacristy door marks the entrance to the heart of the Cathedral. As an artist working in paint, print and drawing, a sense of place is the focus of all her practice. She prefers to be quiet and understated, privileging what is already there, listening to what people, places and things have to tell her. ‘What is it like to be here?’ is the theme running through her academic work too. It’s how she tunes into children’s experiences. Another fundamental aspect of her practice is the idea of acknowledging brokenness and turning it into something beautiful. Alison emails Andrew with an idea for a piece of art based on the damaged door, as a meditation on brokenness. 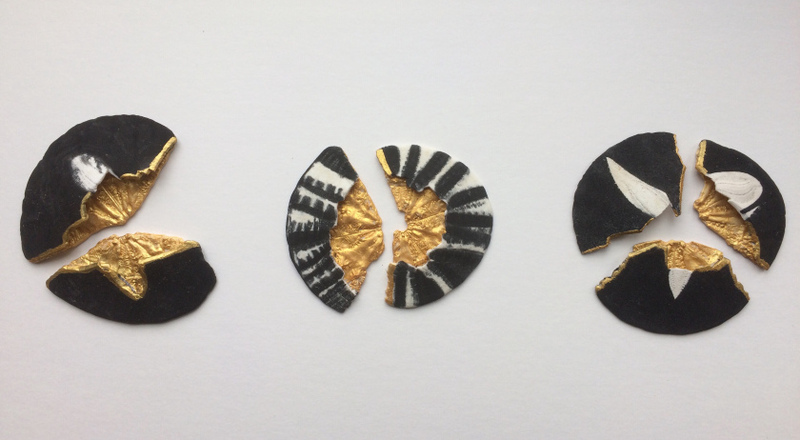 He gets it straightaway, mentioning that a member of the Chapter had told him that, in the Japanese art form kintsugi, you draw attention to cracks with gold rather than pretending that they are not there. (Anne Rooney wrote a post about it here). Andrew and Alison agree that she will take a four-week artist’s residency in the Cathedral, two weeks on either side of the anniversary of the terror attack. ‘Broken Beauty’ will be the name of the project. ﻿‘Quilt’ is inspired by Jesus’s saying, ‘Blessed are those who mourn for they shall be comforted.’ It’s made of nine men’s white cotton handkerchiefs, overlaid with monoprints of dried seaweed roots that look like flowers or mourning bouquets. A seam of gold is sewn through each monoprint. Handkerchiefs, of course, are for soaking up or wiping away tears. Men’s grief, so often hidden, is made visible here. A personal thread runs through this piece: Alison’s father died on Alzheimer’s in 2012. He was a man who had a very well-kept handkerchief drawer. After the anniversary weekend, Alison will host two workshops in the Retrochoir. Attendees are invited to bring a piece of mending, sewing or knitting. Seated in a circle of chairs, people of all faiths or none can gather together to mend and talk. At a practical level, this quiet exercise will draw attention to a prayerful space in the Cathedral where people can seek solace. On a deeper level, the workshop will enact the process of repair to something that’s fragile and beautiful and cannot be discarded just because of damage. Acknowledging that painful truth is part of rightful mourning. Extract from Testimony - a memory project. I went to visit Alison in the Cathedral as she completed her prints this week. I was moved to see the work all together and also to think about the many hours she'd spent in the Cathedral absorbed in documenting the fabric of the place. This is the kind of art that does not prescribe a reaction but invites the viewer into a meditative space with infinite possibilities. Drawn in, the viewer engages and invests. Within each finished print are many stories. Looking at them, I 'saw' images of forests and clouds. Another viewer might of course find other things. From one angle, the gold paint blazes. From another, the gold effaces itself and the story of the stone and wood is dominant. Past and present are in interplay here, as they are whenever we consult our memories. I wish I could say this was my own insight. When I started the Testimony project, I did not really know why except that it felt imperative. It is only over the last year that purpose and uses have emerged. Throughout that time, it's been a privilege to be part of conversations with people like Andrew, Michael, Gilly and Alison, and I am grateful, on behalf of this community, for all they have brought to the healing process. You can book here to attend one of Alison's (free) mending workshops on June 4 and June 7. The TESTIMONY project is open-ended, If you were affected by the June 3 attack and would find it helpful to have your testimony taken, or if you would like to add your account to the project, please email mlATlovric.demon.co.uk (substituting '@' for the 'AT' - this helps cut down spamming). Suburb post. If I were there, I'd surely be with you. Thank you for writing this important post. Wonderful. How heartening that so many good things came out of such a bad thing. Thank you for this post, broken does not mean an end or binned, it adds life, depth and helps you move on. Thank you for this moving account of how art, silently, can help to mend, reframe and remake. Wonderful post, Michelle. Thank you.